When it comes to the best pest control companies, there are some facts that you may not be aware of. First of all, a pest control company can handle a lot of issues but is not a miracle worker. Obviously, the goal is to do whatever possible to eradicate a problem, but unless a homeowner follows the given advice, there is no guarantee of success. As an example, if someone calls a pest control company because of a roach problem but that individual continually leaves dirty dishes in the sink or food laying around the house, the problem is not going to go away. Another example is a homeowner who has a fly problem yet refuses to get a screen window fixed. Simply put, unless the homeowner takes measures to prevent the problem from returning, there is nothing that a pest control company can do. Another interesting fact is that the best pest control in Toronto knows what to look for even when a homeowner does not see pests in the home. For example, during the cold winter months, rodents will work hard to find their way inside. To get an unseen problem under control, local pest control companies will check the weather stripping underneath the exterior doors, look in the attic for potential openings, and look at vents around the foundation for potential entry points. Companies that offer pest control services also educate people how to prevent pests. Obviously, termites are a major threat and cockroaches pose health risks. However, ladybugs are actually a good pest in that they eat aphids, which destroy plants. Some spiders are also good because they eat bad pests. Before applying a treatment, a reputable company will determine if the pests you have are harmful or not. Finally, not all local pest control companies dispose of larger pests inhumanely. When possible, many companies will trap animals like raccoons and then relocate them to a different area where they will not bother homeowners. 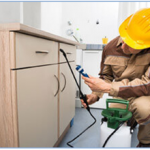 If you have a pest problem and want to hire the best company possible, it is important to look for one that has experience and expertise in this industry. At Pestico, we safely deal with all types of pests, including bugs, raccoons, rodents, and more. Please complete the request an inspection form or call us at 416-747-7378 to schedule an appointment.